An eight part training series based on the book; “Monday Matters; Finding God in Your Workplace.” A practical framework to learn how to integrate your faith into your work. Led by Mark Bilton, experienced CEO and Founder of Called to Business. In this series Mark provides insights and a practical framework that lays out God’s purpose for work. These lessons have been mined from real world commercial experience. Author Mark Bilton has walked with God and seen Him open doors that have taken him from the shop floor to the boardroom; from sales assistant to CEO. 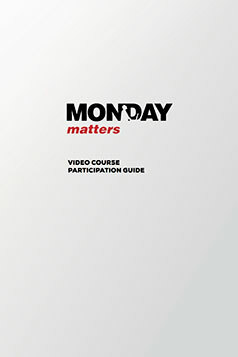 You can access the Monday Matters Video Course in a couple of ways; They are free above for your personal edification. If you want to share or use as a group please purchase the ‘stand-alone’ Videos on DVD, or a USB. There is also a Leader’s Guide and Participant’s Guide that will equip you to run a small group though the course. Check out the Small Group Packages in Digital (USB + eBooks) and Physical (DVD and Paperbacks) versions.